The benefit of Alexa devices lies in voice recognition. Using vocal commands is super fast and efficient when adding items and to-do’s to your Alexa lists – eliminating the need to reach for your phone. The Any.do Skill for Alexa gives you the ability to effortlessly sync those lists to your devices, without any physical action required on your part. Once your lists are synced, you are free to reorder, prioritize and add reminders to individual tasks as well as view them in junction with your calendar. These lists will sync back and forth from Any.do to Alexa, meaning you can always have Alexa read out your items for you. Staying productive on the go has never been easier! 3. Click to Enable the skill and log-in to your Any.do account – done! 2. Click to Enable the skill and log-in to your Any.do account – done! The Skill can also be added directly from the Amazon Store by simply clicking on this link. 1. Go to your Any.do app settings and tap on ‘disconnect from Alexa’. 2. Then, go to the Alexa skill store on the Amazone website > Go to the menu and select Skills > Select Your Skills (at the top of the screen) >Select Disable Skill, and confirm that you want to disable the skill (if prompted). Any skill progress is lost when a skill is disabled; however, address information for your Alexa device(s) is not affected. Make sure to complete both steps for complete removal of the Skill. 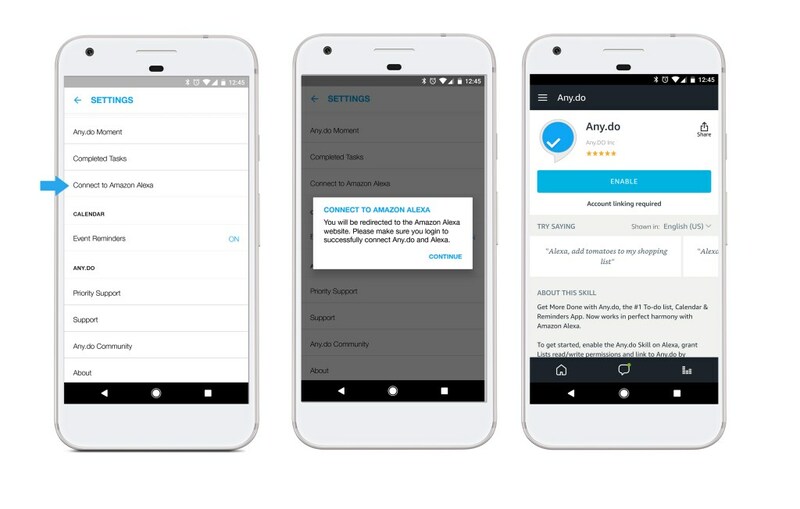 Once synced from your mobile device, your Alexa lists will display on the Web App.